Membership in the Southern Garden History Society is open to individuals, families, historic sites, public gardens or organizations interested in southern gardens and landscapes. 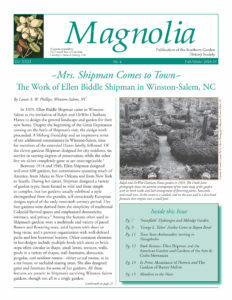 Membership entitles you to receive our information-filled periodical, Magnolia. Being a member also allows you to register for an annual meeting packed with educational programming, garden visits, and opportunities to meet fellow garden history enthusiasts. Members also receive a discount to attend the Biennial Conference on Restoring Southern Gardens and Landscapes in Winston-Salem, North Carolina. Your annual dues allow us to produce Magnolia, provide scholarships to our Annual Meeting, maintain our website, support conferences, present annual awards, and pursue other preservation initiatives. Download the current membership brochure. *Contact the membership coordinator if you would like to pay more than $500 via credit card. The membership year is from August 1st to July 31st. Two people from the same household or organization may register for the annual meeting on one Joint or Institutional/Business membership or above. Members who join at the Sustainer level or above are offered the opportunity to register early for the Annual Meeting. Institutional members will receive 10 extra copies of each issue of Magnolia. If dues are paid after the current-year annual meeting and before July 31, that membership does not expire until July 31 following the next year’s annual meeting. 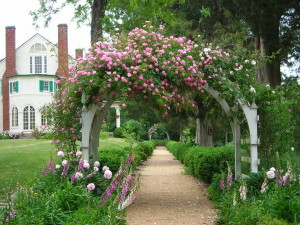 The Southern Garden History Society is a 501(c)(3) nonprofit organization. Your dues are tax-deductible to the extent allowed by law. Join or renew now by submitting your payment online through PayPal’s secure server. You do not have to join PayPal to take advantage of this option. Simply select your desired membership level from the pull-down menu below, then click on the Join Now button. If you are not a PayPal customer, click on “pay now with debit or credit card.” You do not have to join PayPal in order to pay. Note: Please email membership@southerngardenhistory.org if you would like Magnolia and other correspondence sent to an address other than the billing address for your credit card. Click here for a downloadable membership application in PDF format if you are a new member. If you are RENEWING, just send your check to the address below. Introduce a friend to Southern Garden History Society by purchasing a gift membership. Simply mail a check to the address above, along with the recipient’s name and address. If you would like to give someone a gift membership via PayPal, please use the Join Now button above and then email his or her name and address to membership@southerngardenhistory.org. We will notify the recipient of your gift via mail.